Howdy folks, another guest post by Anna’s husband, once again about a Halloween creation. So… it all started with this guy. Immortan Trump! If anyone knows who this guy is, let us know so I can pat him on the back. Yeah, when I came across this photo I just laughed and laughed. Then I decided that a mashup of Donald Trump and Immortan Joe was definitely what I wanted to do for Halloween this year. Since we usually do couples costumes, we decided that the best thing to do for Anna would be a mashup of Hillary Clinton and Imperator Furiosa, or as we dubbed her, “Imperator Hilarosa”. 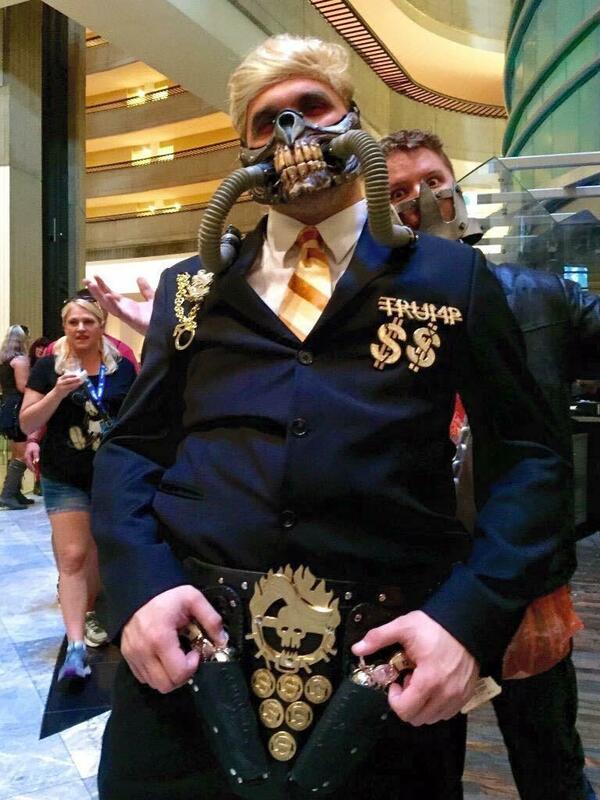 Most of the accouterments for the Immortan Trump costume are available online, and most of what we decided we needed for the Hilarosa costume was more or less available at Goodwill with the exception of one thing… that amazing robotic arm. We found several homemade versions of the arm going for several hundreds of dollars, but nothing that was anywhere near the price we would want to spend on a Halloween costume. Instead, I made one. a metal lamp reflector that was in the garage, $free! approximately 24 hours total of cutting, shaping, drilling, sanding, riveting, fitting, rinse, repeat. We started by taping Anna’s hand up in a glove made of newspaper and painter’s tape, to give me something to work around while she was off doing more important things. I then made the shape of the back of the hand out of plastic cut from the oil pan, and also cut out the shape for the “knuckle” for the middle finger. As you’re looking at the photos, almost all of the black plastic was cut from the oil pan, and the metal parts came from the lamp reflector. I’ll post an aftermath photo at the end to show you what was left when I was done. I also made templates of every piece that I cut out of metal or plastic, if there’s any interest I’ll look into scanning them into a PDF or something. All of the black plastic parts were shaped by heating them up with a heat gun and shaping them around the edges of my work bench. I wore heavy leather gloves and the garage is pretty well ventilated. Since we’re talking about safety, I also always wore my goggles when cutting anything, most of the cutting was done with a Dremel and cut-off wheels, and that sends sharp bits everywhere, especially when you’re trying to be in a hurry and the cut-off wheel explodes on you. The metal shapes of the first two fingers were beat into a curved shape using a ball-peen hammer, then drilled out by hand with a cordless drill. The bulk of the first finger was cut out of metal and also beat into shape using the same method. The two pieces of the first finger were glued together using a long strip of craft foam and E6000. I then started working on the middle finger, cutting everything out of black plastic and gluing it together with a strip of craft foam in the same manner I used on the first finger. I I then fastened it to the “knuckle” using two rapid rivets, and fastened the knuckle to the back of the hand (after making a couple of test fittings to make sure that everything was positioned correctly). Then the bottom of each finger was put into place, more craft foam and a small “ring” of black plastic for strength. I also added a bolt to the end of the middle finger, partially for the look but mostly to keep them from spreading apart. On the right side of this picture you’ll see the inside of the first finger, with craft foam strips that were put into place for support, and also the plastic ring (the thickest strip behind the clothespin). This is what is hiding underneath the craft foam in the other photos. Also pictured here are the beginnings of the elbow brace, cut from a plastic insulated mug. After I finished up the first finger, it was attached on one side using a rapid rivet. This is also where I had a slight disaster (I split the relatively brittle plastic) and decided to rivet and glue in place a reinforcement piece. The ribs on the bottom of the first finger were created from strips of craft foam. The third finger (which contains Anna’s ring finger and pinkie finger) was shaped out of metal in the same fashion as the others, and fastened on one side with a rapid rivet. It was finished on the bottom in a similar fashion as the first two fingers, plastic ring for support and craft foam for looks. At this point I decided I didn’t like the way the gaps looked when the fingers were bent. Even though Anna was going to be wearing a black glove under the hand I figured it would look better with something in that gap, so I took strips of craft foam and embossed ribs into then using a heated file. Those were glued on one end so they would slide back and forth as the finger was moved. Next I shaped the piece that covers the palm and wrist, this was originally planned as one piece but I ended up cutting it into two pieces to make it easier to work with. I say “planned”, though most of this was trial and error as I went. These pieces were fastened with short pop rivets. I also painted the little finger with a light wash of black paint around this same time, so that it would wear away slightly as I was handling the glove. Next I glued into place the dowel caps that would be the “tie rod ends” that connect the hand to the elbow brace. I drilled a hole in the side of each one with enough room for for some movement of the dowel rods. E6000 still remains some flexibility when cured, and I was banking on that to give Anna some wiggle room once it was all together. The dowel caps were glued into place on top of long pop rivets that I scored with a Dremel cut-off wheel. While that was curing I worked on the elbow brace. I glued faux leather to the outside of the plastic piece that was cut from an insulated mug (pictured earlier), fastened another piece of the mug on the outside using rapid rivets, and glued on dowel caps using the same pop rivet method used on the hand. The thumb was made of two more piece of plastic, and put together in a similar fashion as the other fingers, it was finished with a piece of metal that was riveted to small strips of metal that ran from one side of the thumb to the other. This was probably the worst-documented part of the entire process, sorry about that. I then attached a chunk that I cut off of a pair of pliers, a small metal armature made from the same metal as everything else, and a small spring that was in my toolbox. This was all held together with a variety of rapid rivets and pop rivets. After that was finished I painted the dowel caps black and then dry brushed everything in silver to give it a little sheen. I also prepped and painted the dowels (silver) and pens (bronze), they’re in the background of the next photo. After everything dried up, I put it all together for a test fit. The pens have short sections of dowel glued into them, which are then glued into the dowel caps on the hand side, then the long sections of dowel are glued into the dowel caps on the elbow side, and just inserted into the pens. This means the length of the arm can be changed. This gives a little bit of flexibility in the wrist but also means that it will fit other people and isn’t sized just for Anna (there’s a hint in there, somewhere, maybe). I also started adding some of the additional accouterments at this point, such as the cap nut on the back of the hand, the wrench lashed to one of the supports, some aluminum tape shiny bits here and there, etc. The wrench took some modifying so that it didn’t interfere with the rods. I fashioned the pressure lines out of a length of braided clothesline that Anna was kind enough to thread over a piece of wire (she has a lot more patience than I do) and then painted silver, and a piece of aquarium tubing that I inserted a piece of green weedeater line into. This looked pretty good until it was under a black light, then it looked amazing. These were glued into the appropriate places underneath patches of craft foam. I also painted some light weathering in various places, grease spots, etc. We then fashioned the harness out of a few belts from Goodwill. It’s basically a strap that goes up the front of her arm and crosses over her shoulder to her back, and fastens to a belt she wears right under, ah, right at the top of her waist. The other strap goes up the back of her arm, over her shoulder to the front, and attaches to the same belt at her right side. Once we got everything situated we marked where they crossed (at the shoulder, the right side in front, and the right side in back) and fastened them with rapid rivets. The “pressure lines” where then lashed together with some fine wire in a few places, and then attached to the back strap all the way up to her shoulder. If we decide to do a full-on Furiosa costume, we’ll add the shoulder pad and stuff at a later date. I’m also happy to report that it was functional, which is very important when it comes to an adult Halloween costume. Oh, right… I promised that aftermath photo. Here’s what was left of that oil pan and lamp reflector when it was all finished.